This post contains affiliate links. HECR earns a small commission from purchases through these links at no cost to you! 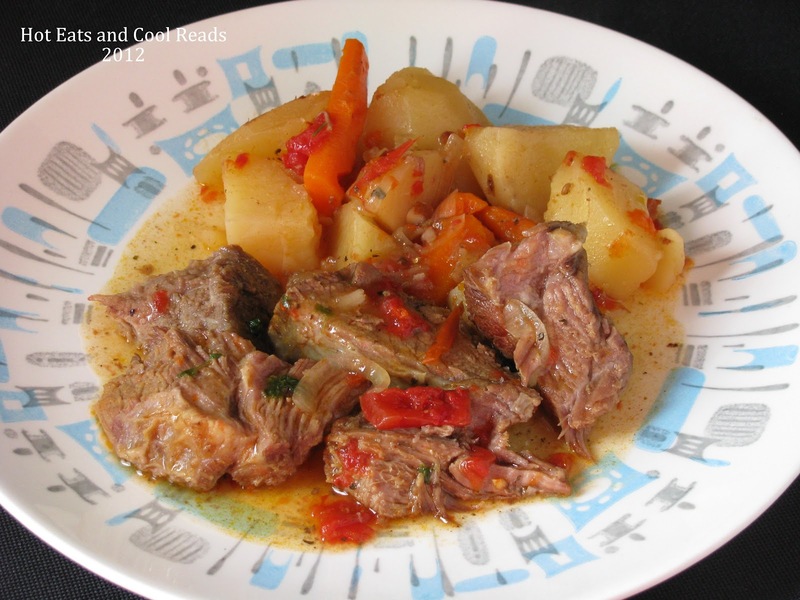 This slow cooked meal is easy, hearty and comforting! Great for Sunday dinner or for those busy weeknights! 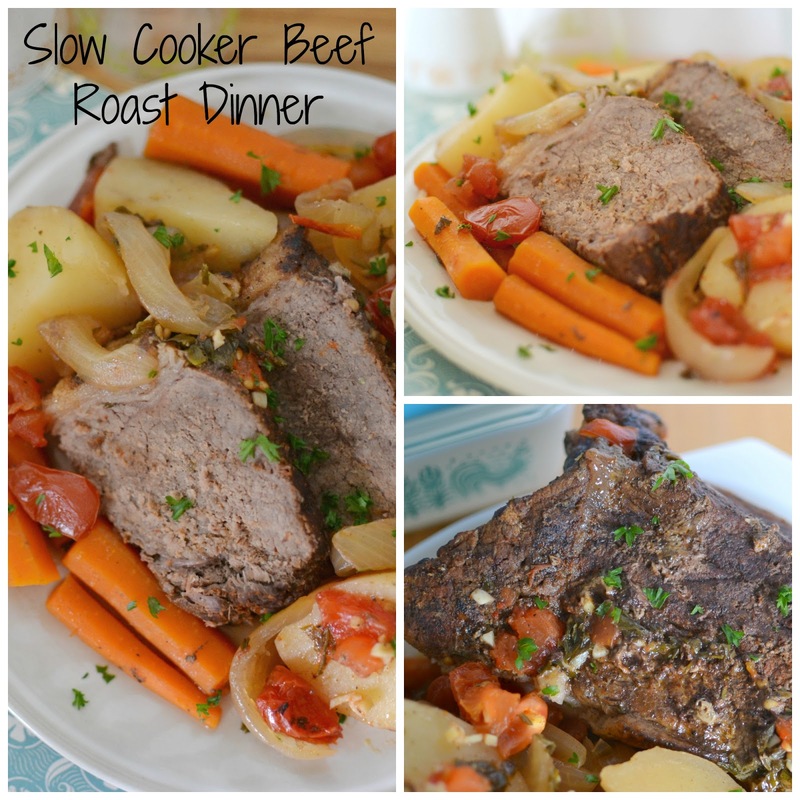 I swear, slow cookers and roasts are made for each other! There are so many varieties of flavors you can use and so many different veggies you can add. I especially love using slow cookers during the week, so I can relax and hang out with my family versus spending that extra time in the kitchen. The recipe I adapted this from was found in a vintage cookbook I have called "Favorite Recipes of America: Meats". It's book 2 of a 5 part set, and they were released in the late 1960's. I love looking through them and discovering interesting vintage recipes! 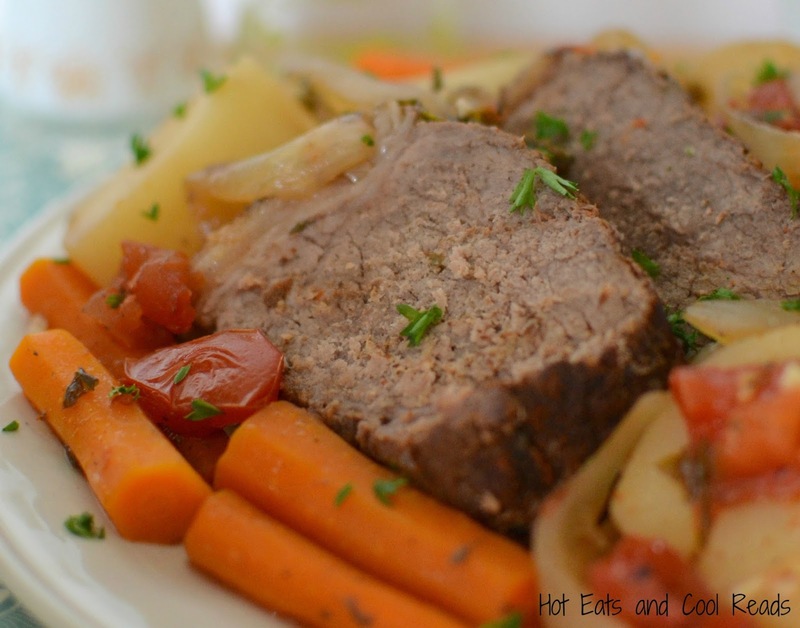 I've made SO many beef roasts in the slow cooker before, but this one has to be my absolute favorite. 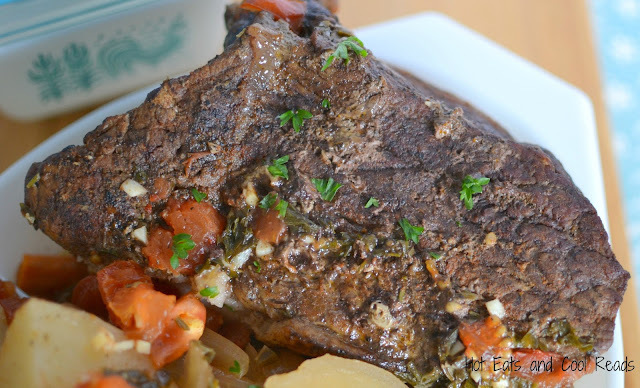 The tomatoes bring such an amazing flavor to the juices, and the beef is fall apart tender. Serve with some bread or biscuits and you have a complete meal! Other recipes using beef you may like: Cheesy Beef and Kale Penne Pasta, Beefy Black Bean Enchilada Bake, Pizza Tator Tot Hotdish, Beefy Orzo and Vegetable Soup, Philly Cheesesteak Biscuit Bites or Mom's Homemade Sloppy Joes! Other Slow Cooker Recipes you make like: Slow Cooker Creamy Chicken Tacos, Slow Cooker Ham Bone and Potato Soup, Slow Cooker Tortellini Chili, Slow Cooker Mexican Veggie, Rice and Tomato Soup, or Slow Cooker Snow Flake Hot Cocoa! Click each recipe title to view! Enjoy! Combine sugar, paprika, garlic salt and black pepper in a bowl, Rub the roast on all sides with the seasoning mixture. Place the roast in the hot skillet with the olive oil, and sear roast on all sides until browned. Turn on your slow cooker to the desired setting, high or low. Mix the beef broth and balsamic and pour into the slow cooker. Add the beef roast. 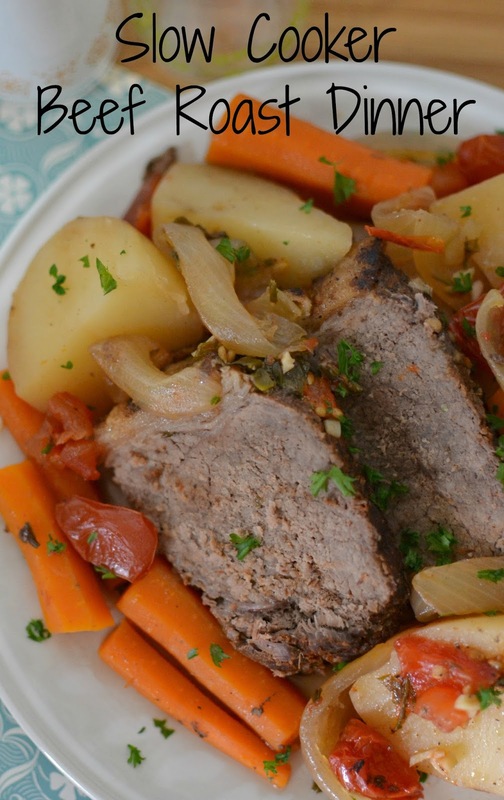 Surround the beef roast with the potatoes, onions and carrots. Combine the tomatoes, garlic, basil, parsley, rosemary, salt and pepper, Pour over top the rest of the ingredients. Cook on high for 4-5 hours, or low for 7-8 hours. Remove the roast and veggies to a serving platter. Turn slow cooker to high. Combine cornstarch and water until thick. Add to the juices and simmer until thickened. I love slow cooker recipes and this looks delicious! Thank you!! I love slow cooker recipes too! Thanks so much Marsha!! I love sharing with you every week and thanks so much for your kindness! I have been experimenting with my crock pot a lot lately. I truly want to tell my crock pot, "I love you." But I have had good meals and bad meals coming from it.....LOL!! This meal looks absolutely delicious! I now have another one to try. This is an awesome share at Foodie Friends Friday. Thank you! I love my crock pot... Have never thought of using sugar when making roast and may give it a try the next time I make it. I made a roast last week in my crock pot but as we busy in the afternoon at work, I forgot to text my husband to add more liquid or turn it to warm and the roast was very, very done... stuck to the bottom done as it had been cooking for 12+ hours. Thanks for sharing on Foodie Friends Friday. I've never thought of sugar before either! It's helps brown the roast so nicely! Thanks so much for hosting Marlys!! Thanks so much for the invite! I make a ton of roasts in the crockpot too! Now this is a meal that says Hello Fall. It is a rainy day here and this looks wonderful! Hope you are having a great weekend and thank you so much for sharing with Full Plate Thursday. Yum! This looks amazing! I love cooking a roast for dinner. I can’t wait to try the recipe. Thanks so much for linking up to Creative Thursday. Can’t wait to see what you share this week! Have a wonderful week. Thanks Michelle! You will love this one!